In an attempt to retain their share of the market, manufacturers tend to increase the specification of their caravans year-on-year. That’s fine if you’re looking at the mid and upper sectors, but can be a problem at entry level, because you can bet there’ll be a price increase too. That has been the case with Sprite; Swift’s entry-level range. They’ve progressively moved more and more upmarket, to the point that they’re now possibly more mid-market, especially if a couple of the option boxes are ticked. Enter the new Sprite Freedom range that’s been launched for the 2016 season. Still built using the SMART Plus construction, but with a spec (and price) aimed at first-time buyers. 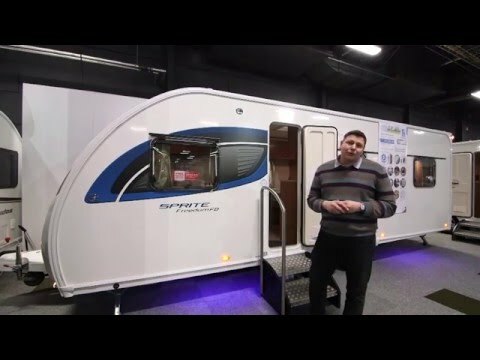 Here we review the six-berth FB. And to see other Sprite caravans for sale, click here. Sporting a contemporary bodyshell, it’s only when you look closer that you realise that the Sprite Freedom FB is an entry-level tourer. Starting at the front, there’s no stabiliser on the Al-Ko hitch, and there’s one big single panoramic window. The lightweight steadies are all easy to access. Moving to the sides, you’ll notice that the steel wheels are fitted with plastic wheel-trims, and that there’s no window in the entrance door. All the essential connections are sensibly located on the offside, but there is no external mains socket and no gas barbecue point. You do get cycle rack fittings on the rear, though, and all the main controls are just inside, above the entrance door. Basic, but functional and spacious, best describes the lounge of the 2016 Sprite Freedom FB. That huge front window lets in lots of natural light, which is good as there’s no sunroof or Heki type rooflight. Thanks to the light coloured fabrics though, it never feels gloomy, and is spacious enough to seat six, especially as there’s no centre chest, just a small flip-up table. When it’s dark outside, there’s only a single ceiling light and a pair of spotlights. And carpets are an option. You do get blinds and flyscreens though, and the Truma Combi 6 boiler should keep things nice and cosy. The side dinette is spacious enough for two, although there’s just a single LED strip light for illumination at night. Like the lounge, the kitchen is very spacious but without any frills. What you do get is a three-burner gas hob and grill, and a 113-litre fridge freezer. There’s no oven or microwave, although the latter is an option. You also get acres of work surface space, aided by having a removable drainer, and loads of storage options. Thanks to the lack of the oven, there are three large cupboards in the kitchen unit (and a cutlery drawer), together with four overhead lockers, one equipped with crockery racks, and a couple of narrow shelves on the bulkhead between the kitchen and the fixed bed. Once again, lighting is adequate rather than brilliant, with a ceiling light and a small LED strip light. There is a window and a pop-up rooflight for ventilation. A combined shower/toilet area is in the rear offside corner of the washroom, next to the fixed bed. It’s not lined, but there is a shower tray, and a wrap-around curtain to keep splashes to a minimum. The toilet is an electric-flush unit, though. A pop-up rooflight solely takes care of the ventilation as there’s no window. The sink and small dresser unit is located between the wardrobe and shower/toilet. It has a small cupboard underneath, a mirror above, and a couple of shelves to the right. There’s a towel ring next to the sink, and a blown air outlet should keep the area warm in cooler weather. For privacy, a concertina screen shuts off the bed/washroom area. A fixed bed with a Duvalay Duvalite mattress is in the rear nearside corner. It’s good to see that there are a pair of small shelves for the morning cuppa above the bed head too, something that’s often missing on other manufacturers’ top end offerings! Once again, though, there’s just a single LED strip light. The caravan’s only TV point is high up above the foot of the bed. Moving forwards, there’s the side dinette on the offside, which converts into a pair of bunks, although being only 1.80m (bottom) and 1.76m (top) long, they’re probably best suited to youngsters. At the front, there’s the option of decent sized singles (1.80m x 0.72m on the nearside, 1.90m x 0.72m on the offside), or a massive double, measuring 2.02m x 1.80m, thanks to the lack of a front centre chest. One benefit of not having all the bells and whistles in terms of equipment (especially in the kitchen) is that space is left for storage. The Sprite Freedom FB is no exception to this. The front nearside bunk is totally devoid of clutter, and there’s some space under the offside one too. Excluding the four in the kitchen, there are nine overhead lockers elsewhere in the caravan. We’ve covered kitchen storage elsewhere, so moving to the side dinette area, both underseat areas are clear. Although the spare wheel is stored under the fixed bed, there’s still plenty of storage space under there. The decent-sized wardrobe (with a hanging depth of 1.35m) is between the side dinette and bedroom. Care will be needed to not exceed the MTPLM. Externally, the Sprite Freedom FB looks anything but entry-level. It has a smart bodyshell adorned with simple but striking graphics, and is built to the same standard as other Swift products. Internally, it does initially feel and look a little sparse. But what do you expect for the price? It pretty much has most things that you’ll need to start with, and really lends itself to upgrades throughout the period of ownership. Although the FB is designed as a six-berth, we think that it might appeal to couples too, who venture to warmer climes for holidays and don’t want all the bells and whistles, but want a spacious caravan. If you’re after a no frills caravan, the Sprite Freedom FB must be worth a look.